I NOSTRI VINI SONO STATI INSERITI CON OTTIME VALUTAZIONI NELL'ANNUARIO DEI MIGLIORI VINI D'ITALIA 2017 DI LUCA MARONI. 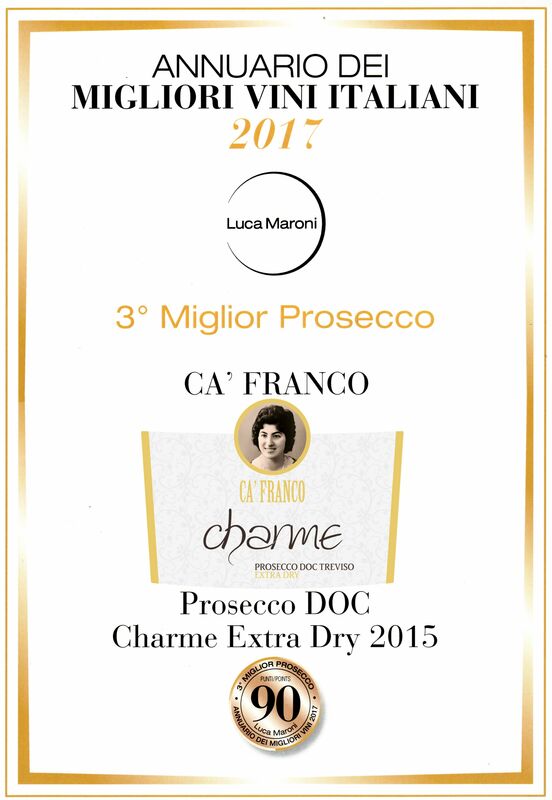 TRA QUESTI IL NOSTRO PROSECCO SPUMANTE MILLESIMATO CHARME SI E' AGGIUDICATO IL PREMIO COME TERZO SPUMANTE IN ITALIA DI QUESTA EDIZIONE. L'ANNATA 2016 OLTRE ALL'ARGENTO VINTO DAL CABERNET DOC PIAVE EL BIJO AL CONCORSO INTERNAZIONALE DEI CABERNET IN FRANCIA, HA VISTO LA NASCITA DEL NUOVO PRODOTTO TOP CLASSE PER LA NOSTRA AZIENDA IL FRANCO APPREZZATO E RICONOSCIUTO ORMAI DA MOLTE PERSONE; E L'ARRIVO ANCHE DI QUESTO PREMIO TANTO INATTESO QUANTO ESTREMAMENTE GRADITO CI HA RIEMPITO IL CUORE DI GIOIA. SEMBRA POCO, MA PER CHI COME NOI LAVORA PRIMA DI TUTTO METTENDOCI PASSIONE, ANCHE I PREMI SONO OSSIGENO CHE DONA FORZA. DEI RINGRAZIAMENTI DOVEROSI: GRAZIE A MIO PAPA' CHE MI HA TRAMANDATO LA PASSIONE E L'INSEGNAMENTO PER QUESTA ARTE LAVORATIVA, PER LA CURA DEL TERROIR E DEL PRODOTTO; GRAZIE AI COLLABORTORI TUTTI (LA MIA FAMIGLIA, MIA MAMMA, I COLLABORATORI AZIENDALI, L'ENOLOGO, GLI IMBOTTIGLIATORI, GLI AMICI SPESSO COINVOLTI COME TESTER DI NUOVI VINI O IN EVENTI COME LE PREMIAZIONI) E ASSOLUTAMENTE AI CLIENTI CHE IO AMO CONSIDERARE PRIMA DI TUTTO AMICI CHE APPREZZANO IL NOSTRO VINO E LO TRASMETTONO AD AMICI E CONOSCENTI COME L'APE TRASMETTE IL NETTARE DEL MIELE PER FAR CRESCERE LA VITA NELL'ALVEARE.